Sweeping out the frequency of an alarm that produce continuous spectrum has some benefits. First, it improve the alertness of the signal since people normally get alerted on the perception of “change”, and it works for almost any signal (audio, visual, thermal, etc.). Second, sweeping the frequency makes sure that all people will get their sensitive spectrum covered. With these benefits of continuous frequency sweeping, lets make the electronic circuit. The circuit of this siren consist of basic alarm circuit and classic flip-flop circuit. The schematic diagram of the circuit is shown in the figure 2. We can still modify this circuit by using the louder alarm sub system from our previous amplified version of the basic alarm, just read the schematic and I’m sure you’ll get the idea on how to modify it. The sweeping frequency is determined by the flip-flop frequency, so you can change this by changing the value of C3 and C4, as well as R5 and R6. If you want, you can make adjusting the sweeping frequency easier by replacing R5 and R6 using a stereo potentiometer, but you should insert a 10k resistor in series with each track of the potentiometer. It makes sure the base of the transistors is not directly connected to the supply voltage when you turn the pot maximally to one of its sides, otherwise the base emitter layer inside the transistor will potentially get fried. Watch how this siren circuit make a sound when assembled and get powered on, in our Youtube video channel below. 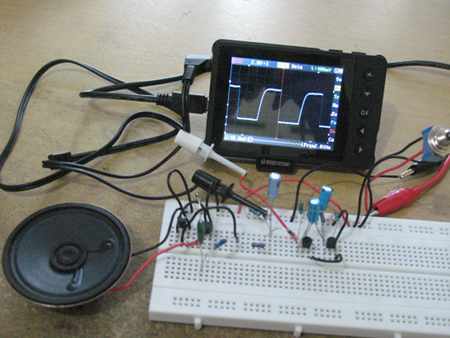 The oscilloscope show the sweeping signal fro the TR4 collector.